If someone (like me for example) would come up to you after and ask you exactly WHAT wasn’t the same, the answer might not be easy. With restaurants, their brands are a synesthetic mix – maybe the food has changed, maybe the décor, maybe the lighting, maybe the seating arrangement, maybe the ambient aromas, maybe the music has been turned up, turned down, or turned on its head. A good restaurant brand is a combination of these things. Experiential branding is like a chemical equation – too much of this or too little of that can upset the entire balance. When the main product is good, people will give your restaurant wide latitude to drop down in other areas. But after awhile the music might really bother them or the bad service will begin to bug them. Eventually they may find another place to eat their confit de canard aux truffes blanches. People will continue coming to your restaurant, and recommending to their friends, when all these elements are harmonized. You will see for yourself when you get it right by an increasing number of people you serve after making a change. The process takes time, but ultimately your brand will benefit from the effort. Some restaurants hit on a small number of best sellers and have a very short menu. Others will have a tome that takes half an hour to read before ordering. In the end, the restaurant patron wants to find something to his or her liking, without too much trouble. Keep your menu concise, but make sure a few best sellers are kept off the menu. Waiters can tell new customers about it, and old customers feel special by ordering off menu. 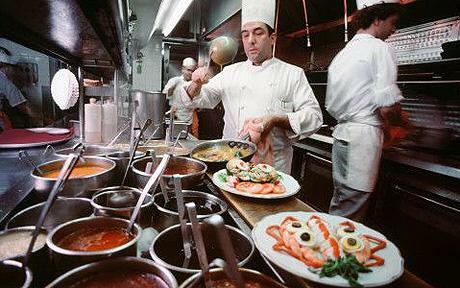 The chef might also poll the customers every now and then to make sure people are happy with the offering. A short chat will suffice to see if you are headed in a good direction. The brand builds trust by showing that it will do everything it can to please you. 2. Your Waiters are Your Ambassadors: Train Them Well! The waiter has a crucial role to play. They must be congenial, accommodating, and able to break the bad news well while offering alternatives to surpass expectations. Waiters should be trained to maintain a middle distance from the customers. They should not become best friends with them, nor should they be efficient robots. Areas to look at for training are in dealing with difficult people, with complaints, and with conflict. And it goes without saying they should know everything about the food being offered. It seems obvious, perhaps, but remember that the waiter is often the only point of contact between the patron and the restaurant. Since there are fewer and fewer professional waiters, invest in their training. It will pay off. Returning customers will always want to find their familiar favorites. If you intend to change the menu, avoid radical changes. If your chef wants to introduce a fully new menu, it should be done over time – maybe even a year. Drastic change runs the risk of alienating the customers – making them think they are in the wrong place. And the damage to the brand could be irreparable. If you want to change anything in the ambience, make sure that it can be done in increments. Mix in different music, for example, over time until the new one becomes dominant. Small details can make a major difference in your restaurant. Have the smells emanating from the kitchen changed because you changed your menu or the kind of soap you are using? Are the lights all working? Can they be adjusted according to the time of day or according to the customer’s preference? This requires a lot of monitoring to make sure you get it right. Assign someone to keep their eye (and other senses) on these small details. Since the restaurant is an experience, it should also be dynamic. Even if everything is perfect, if nothing ever changes the customer will not be enticed to come to you. Try exotic daily specials or occasional live music to spice up to the experience for the customer. Perhaps a complimentary drink or appetizer would surprise the patron. Small gestures like these separate you from other restaurants, and in this you are free to try anything you like without fear of damaging your brand – the fact that you do surprise them from time to time can be part of your brand. It allows them to visit you when they feel like a traditional favorite but might want something a little new too. There are many factors which will help you build your brand, but a branding professional will tell you that trust and loyalty are built and won through consistency in quality, service, image, and presentation. These five are what might be called table stakes, and if your restaurant could use a boost in its branding, many other strategies and tactics can be employed. After all, if it is all about keeping them coming in, then the experience must always be memorable and pleasant.